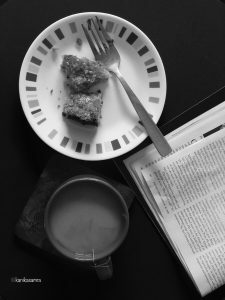 Baking – my first love! I love cakes and all things sweet. In fact my foray into cooking began with baking. Each year in middle and high school we would have an annual picnic where my friends and classmates would volunteer to bring snacks, drinks or packed tiffin meals. Once my secret was out – which I might have had a hand in initiating – I became the designated baker, assigned the task of bringing a cake. The story began with my mother. My mother was always experimental with food. While she wrote down recipes in a number of diaries, she rarely consulted or followed them to the T. In fact she used ideas and adapted them to what was available. This philosophy and attitude towards cooking at home has stuck with both, my brother and I, as we regularly create new stews and Indian style curries for ourselves with ingredients at hand. As a science educator with a great sense of colour, my mother was the first one to introduce me to the use of food safe colours. So of course, I delighted in using them in my cakes. I didn’t take it all the way to the current Unicorn levels, but definitely made marble cakes with vanilla, chocolate and a couple of other colours. So it’s hardly a surprise that baking a cake doesn’t put me off. It is one of my favourite tea time snacks and dessert. 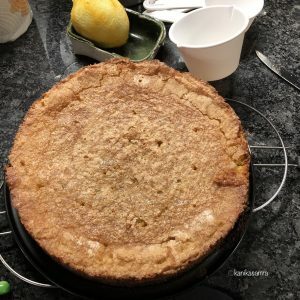 The most recent occasion to bake a Lemon Cornmeal Cake was a dinner invite by a friend. He offered to make sourdough pizzas for us, all from scratch. So it was only appropriate for me to take dessert. I love lemon cakes and searching on the internet, I found Nigella Lawson’s Lemon Polenta Cake recipe. The golden crust on her cake and it’s beautiful crumbly texture, had me hooked. I wanted a bite of it! So that’s when my search for polenta began. As Nigella points out in her recipe, cornmeal serves as a good replacement. So that’s what I did. But there are a few other things that I changed. Read on. While the oven heats up, collect all your ingredients. Recommended: If, like me, you possess only one set of measuring cups and spoons, measure dry ingredients first and keep them in separate bowls. Rule of thumb for baking is to start by adding fat (butter or oil) to the bowl and then 1 cup of sugar. Keep 1/2 cup sugar for the syrup. Next, cream the sugar, i.e. beat them together with a whisk or in a mixer until you get a creamy mixture. *About using oil – Nigella recommends oil for making the cake lactose/dairy free. If you have browsed other cake recipes, you know I use only oil. Olive oil makes any cake light, airy and incredibly soft. Try it! I use the leftover oil, sticking to the sides of the measuring cup to oil my cake pan. Next, crack eggs, one at a time into the bowl with sugar and oil. Beat each well before adding the next. In a separate bowl mix together the cornmeal, ground almonds and baking powder. I ground almonds at home for this cake without blanching them. If you have almonds, do this or use store-bought almond meal. ***If you are allergic – Don’t Use ALMONDS! Instead increase the amount of cornmeal. Almonds are used to add flavour to the cake. IF the almond meal is not too fine, then it adds some crunch. 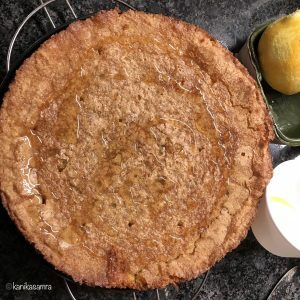 Increasing the amount of cornmeal to compensate will not affect the overall impact of creating a granular, citrus cake. 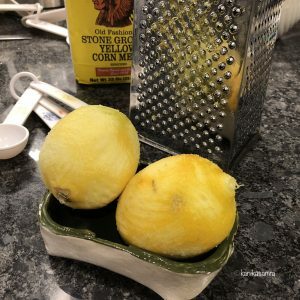 In another bowl have the juice of 1 lemon handy, along with zest from both lemons. Reserve the juice of 1 lemon for the sugar syrup. Nigella recommends adding the flour mix and then alternating with 1 egg at a time, until all of the flour has been incorporated. After creaming the sugar, beat in the eggs – one at a time. After this start by incorporating the flour mix such that you do it in three parts. Add a bit of it, mix well and continue until all of it has been added to the batter. Finally, add the juice of 1 lemon along with the rind. I like my cake very lemony – just rind isn’t enough. Mix well by folding, instead of whisking. Transfer to the baking tin and bake for about 40 minutes. Ideally, use a cake tester to check the cake. If it comes out clean, cake is ready. If you don’t posses a cake test, then use a clean skewer, but sparingly. Baked and waiting for to soak in a lemony sugar syrup. Once the cake has cooled down a little, prepare a sugar syrup by heating juice of one lemon with 1/2 cup sugar until all the sugar dissolves. Since I drifted from Nigella’s recipe – this syrup is going to be thicker and only about 1/4 cup in quantity. **A note about sugar used here. In the USA white granulated sugar is very fine. Hence, there is no need for using confectioners sugars. 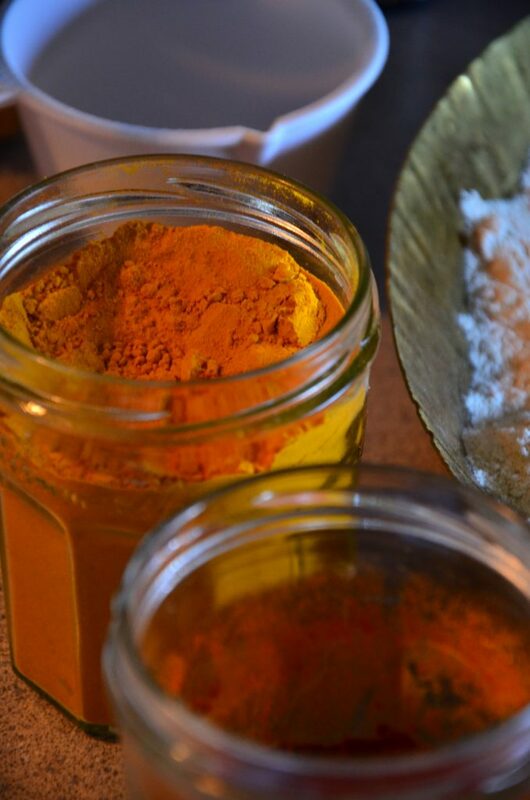 But if you have raw sugar or cane sugar at hand then either grind it or buy confectiober’s sugar for the syrup. Poke a few holes in the cake with a cake tester. And if you don’t have one, then don’t poke it at all. Go ahead and spread the syrup all over and gently spread it. Don’t worry if some of the top skin of the cake moves, it’s very tender when the cake is warm. Let it soak the syrup and cool down completely before taking it out of the pan and slicing. The syrup gives this cake a beautiful sheen. This cake, I promise, is the perfect companion for prose induced reveries. 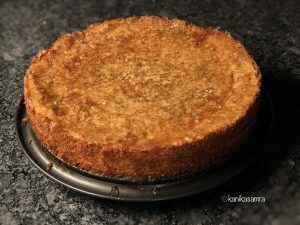 Lemon Cornmeal Cake – a great tea time snack! A golden moist cake that is perfect for a tea time snack. Start by adding fat (butter or oil) to the bowl and then 1 cup of sugar. Keep 1/2 cup sugar for the syrup. Beat in the eggs – one at a time. Finally, add the juice of 1 lemon along with the rind. Transfer to the baking tin and bake for about 40 minutes. Use a cake tester/ toothpick to check the cake. Prepare a sugar syrup by heating juice of one lemon with 1/2 cup sugar until all the sugar dissolves. Poke a few holes in the cake and spread the syrup all over. Let it soak the syrup and cool down completely before taking it out of the pan and slicing. The syrup gives this cake a beautiful sheen. ** I ground almonds at home for this cake without blanching them. If you have almonds, do this or use store-bought almond meal.